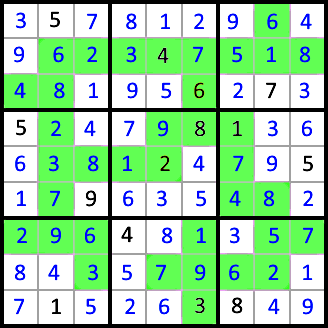 The grid below, when filled in, forms a valid Sudoku grid. It can also be filled in like a LITS (nuruomino) puzzle without the 1x4 tetrominos. Fill in the numbers in the grid. Each 3x3 region in the Sudoku grid contains exactly one tetromino, which is either a L, T, or S tetromino. The tetrominos obey the rules of a LITS puzzle. The shaded yellow spaces are part of a tetromino. Each tetromino contains four numbers that add up to 20. No two tetrominos may contain the same set of four numbers. 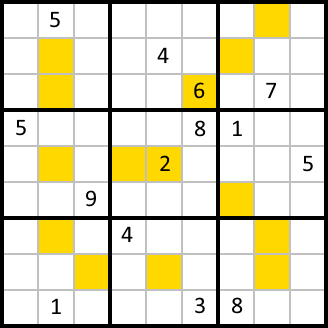 The tetrominos (each in its own 3x3 region) are arranged in a 3x3 Sudoku, using tetromino shapes L, T, and S instead of numbers. If two regions contain the same tetromino shape, then they cannot share the same horizontal alignment or vertical alignment. I believe I have found multiple solutions to the puzzle. It is possible that there is a nuance to the rules that I missed that disqualifies one or both of them. My understanding of the rules did not allow for a full logical deduction of the solution, so these were both found by brute force. The answer by P... is correct. However, it is not the solution that I had originally designed. I overestimated the degree of logical deduction involved in solving the puzzle, and did not realize that a brute force approach could yield a different answer. Not the answer you're looking for? Browse other questions tagged sudoku grid-deduction polyomino or ask your own question.